You can feel the excitement buzzing in the air, and that can only mean one thing: it’s time for the annual eNonprofit Benchmarks Study. 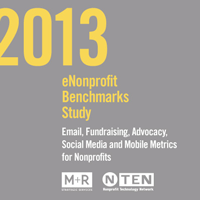 Along with our friends at NTEN, we crunched data on email, fundraising, advocacy, social media, and mobile from 55 of the nation’s leading nonprofits. What came out is the one and only indispensable guide to what’s happening online for nonprofits. Online revenue was up 21% last year. Monthly giving was positively booming, up 43%. Social media audience sizes skyrocketed in 2012, with nonprofits’ Twitter followers increasing by 264%. Metrics like click-through and response rate went DOWN for both fundraising and advocacy emails. Eep! Response rates down? Well, there’s more to it. And for the full story, you’ll need the full report. So what are you waiting for? Your free copy of the 2013 eNonprofit Benchmarks Study is just waiting for you to give it some love. And if you want the top findings and key stats in one tidy little package, check out the irresistible infographic (you might have seen it featured on Mashable yesterday). April 12: Catch us at NTC in Minneapolis for a highly anticipated session on this year’s trends and metrics. April 23: Join us for a chat with the authors and find out what the data means for your organization. This is an in-person event but will also be broadcast online as a webinar.